446 – ca. 386 BC), son of Philippus, of the deme Cydathenaus, was a prolific and much acclaimed comic playwright of ancient Athens. Eleven of his forty plays survive virtually complete. These, together with fragments of some of his other plays, provide us with the only real examples we have of a genre of comic drama known as Old Comedy, and they are in fact used to define the genre. Also known as the Father of Comedy and the Prince of Ancient Comedy, Aristophanes has been said to recreate the life of ancient Athens more convincingly than any other author. His powers of ridicule were feared and acknowledged by influential contemporaries - Plato singled out Aristophanes' play The Clouds as slander contributing to the trial and execution of Socrates although other satirical playwrights had caricatured the philosopher. The demagogue Cleon once prosecuted Aristophanes for slandering the Athenian polis with his second play The Babylonians (now lost). 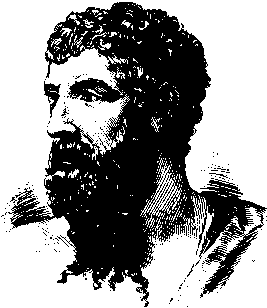 Details of his trial and punishment are not recorded but Aristophanes replied with merciless caricatures of Cleon in his subsequent plays, especially The Knights.